The framework for integration over path space described by Veach REF1 can be extended to integrate over volumes (REF3 and REF4), using the original rendering equation as a boundary condition. An alternative framework was also developed by Lafortune in REF2. In the approaches described by these papers, scattering events are sampled according to the cumulative scattering density along a ray. Here is some programmer art rendered using a brute force bidirectional path tracer that implements this approach, stopped at around 1000 samples per pixel. 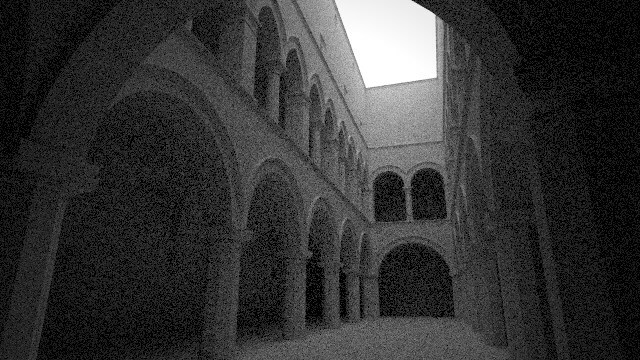 Still noisy but working volume caustics, so achieves my goals. Since this is a brute force sampling (no MLT or manifolds) there are still issues with SDS paths that show up as unexpected bright spots on the glass sphere. If I manage to resurrect MLT code for REF5 I’ll post an update. This post is an attempt to gather together the definitions and equations for the weighted path contribution and MIS probability ratios for this sampling technique, as I’ve not seen this written down all in one place (with all of the interior terms of the weighted path contribution cancelled etc). Where possible I’ve tried to use similar notation to REF1, REF3 and REF4. This post is unapologetically maths-heavy! Metropolis Light Transport for Participating Media by Mark Pauly, Thomas Kollig, Alexander Keller (EG 2000). Manifold Exploration: A Markov Chain Monte Carlo technique for rendering scenes with difficult specular transport by Wenzel Jakob, Steve Marschner (to appear in SIGGRAPH 2012). These $N$ VPLs are then resampled into $N^\prime$ VPLs by considering their estimated contribution to the camera. Finally the $N^\prime$ resampled VPLs are used to render an image of the scene. In this post I’ll describe how I think this approach can be generalised to generate VPLs using all the path construction techniques of a bidirectional path tracer. As usual I’m going to assume the reader is familiar with bidirectional path tracing in the Veach framework. I should state that this is an unfinished investigation into VPL sampling. I’m going to describe the core idea and formally define the VPL “virtual sensor”, but proper analysis of the results will be part of a future post (and may well indicate that this approach is not advisable). 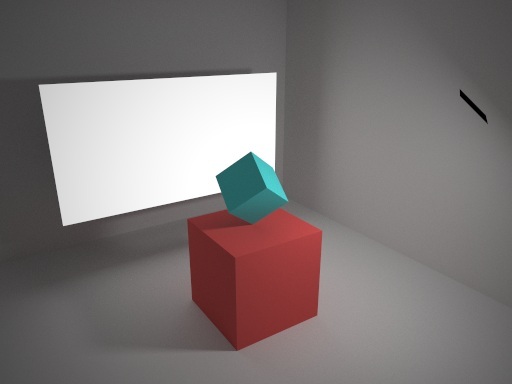 In this post I will briefly cover how I implemented sampling of external light sources in a path tracing framework, concluding with an observation about sampling multiple external light sources that are non-zero over very different solid angles. I’m going to assume the reader is familiar with path tracing in the Veach framework. 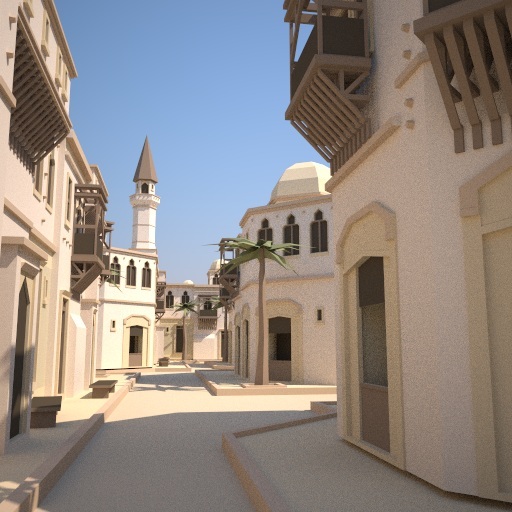 Ray Tracey’s latest blog post has Brigade 2 renders of a nice-looking walled city scene created using Google SketchUp. The model came from this gem of a collection by “LordGood” (who evidently is a big Assassin’s Creed fan) hosted on Google 3D Warehouse. Currently I only have a Blender exporter, and sadly the SketchUp-Collada-Blender path was producing garbage, but even the free version of SketchUp allows custom ruby plugins. After a bit of hunting around I found this OBJ exporter ruby plugin which worked very well, and now I have much nicer test meshes than my bad Blender programmer art. Nothing new here, just highlighting the 2004 paper Illumination in the Presence of Weak Singularities by Kollig and Keller. 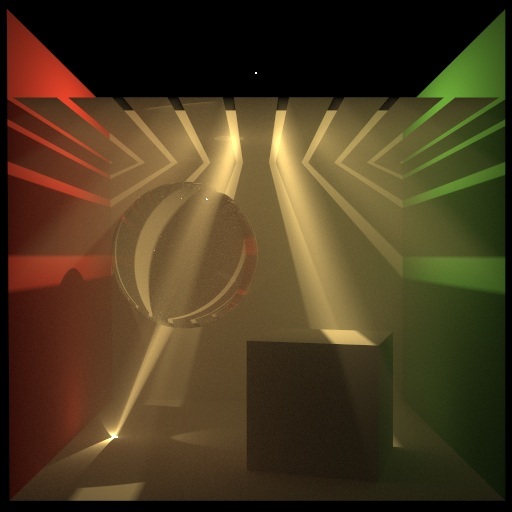 This paper presents a simple and elegant solution to the problem of clamping the geometry term when using virtual point lights for illumination. Any BSDF is the ratio between the two: a patch receives unit irradiance from some incident direction, the BSDF defines the radiance emitted for each outgoing direction. At no point is (non-projected) solid angle used as a measure for the patch in question, yet many references and implementations consider probability density relative to this measure. In this post I will argue that using projected solid angle directly is more natural. I’d like to share my results from converting a CPU-only bidirectional path tracer into a CPU/GPU hybrid (CPU used for shading and sampling, GPU used for ray intersections). These results are a bit old… I posted them a while ago as a thread on ompf. I found out later that this thread had been cited in Combinatorial Bidirectional Path-Tracing for Efficient Hybrid CPU/GPU Rendering, so let me summarise it here. I hate dome lights. You always waste a ton of rays that are occluded by geometry, and the situation gets even worse when lighting indoor scenes with exterior dome lights! So why not help your renderer out and place portals that, when hit, teleport to the dome light. Then instead of sampling the whole skydome, we just sample the portals, and avoid sending rays where we know they will be occluded. This post is about a path tracing technique that sits between unidirectional path tracing and bidirectional path tracing. Like unidirectional path tracing, you only need to track a fixed amount of state, regardless of maximum path length. This is potentially nice for GPU implementations where you usually want to avoid hitting memory and have a large number of paths in flight. You can efficiently multiple importance sample between forward and reverse paths, so you can get reduced variance compared to unidirectional path tracing for some types of scenes (e.g. caustics). In this post I’d like to cover how to multiple importance sample between forward and reverse paths, and show some test images.